There’s a new superhero in town and he is white and furry, has a cute button nose and he sure looks uber-cool in his aquamarine dive suit and matching sailor hat. 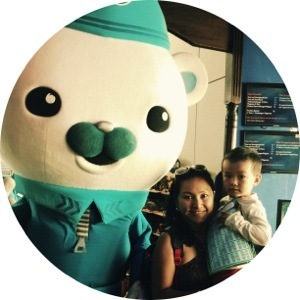 Armed with his trusty compass, you can always count on Captain Barnacles and his fellow Octonaut compatriots to rescue and protect all sea creatures in the deep blue. This is one cartoon superhero I have no worries about my boys emulating. 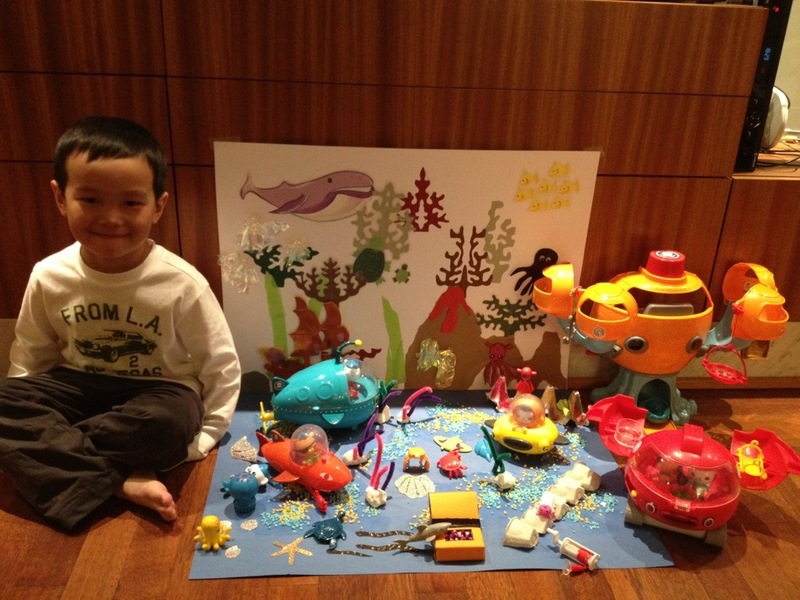 Not only does Timmy learn about appreciating nature and helping others in trouble from the show, he and I have also learnt alot about sea turtles, electric torpedo rays, anemones, sea cucumbers, sperm whales (this is the only time he’s allowed to say the word ‘sperm’) and colossal squids with giant ‘testicles’. My son has trouble pronouncing ‘tentacles’. Did you know there is an actual fish with a hawaiian name – Humuhumunukunukuapua’a? 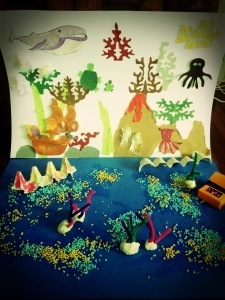 Timmy and I did an ocean scene for our art & craft project recently. 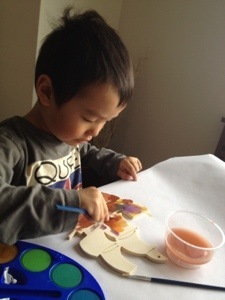 He had fun painting a wooden shipwreck, sticking colorful pipe-cleaners into modelling clay so they look like psychedelic seaweed, spreading colorful pebbles and glitter glue to make our beautiful seabed, and crushing pink transparent wrapping paper into jellyfish form. I’ve been thinking about the myriad cartoons and TV personalities children nowadays are exposed to, especially since my son is at the age to start exploring concepts of good and evil, superheroes vs villians, what is considered cool or uncool, and what superpowers to have – typical issues adults consider on a daily basis. It’s really sad that there is only a pitiful number of worthy superheroes that kids can look up to and aspire to be. I’m so sick of seeing every other 5 year old boy wear Batman or Superman T-shirts, don Spiderman masks for every costume/birthday party we’ve been to, consider it ‘creative play’ when they attempt to jump off chairs in restaurants, scale the narrow walls in elevators, growl at old people like they are evil monsters or try to throw wet rolls of toilet paper onto the ceiling to see if they’ll stick like ‘spider webs’. For now, I think I can still live with Timmy saying ‘testicles’ instead of ‘tentacles’. It is by far a lesser evil than him asking me for a Justin Bieber haircut.